Up early; mail, bit of code hackery - good, cleaned up some horrible snafus in my yet-another-thread-pool-impl. Lunch. Sync with Tor & Kohei, caught up with Kendy; customer/partner call. Chat with Thorsten, and massaged text. Sophie finally up-loaded all the great content from the conference to the LibreOffice Youtube Channel. 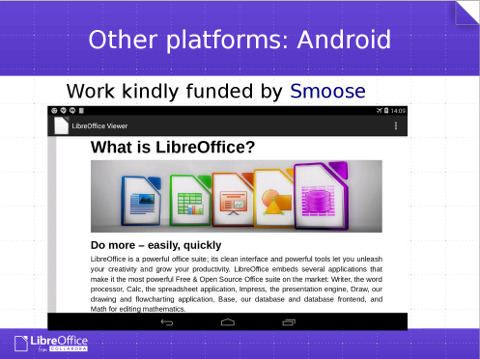 My Keynote from the LibreOffice conference: Money fairies, Consultancy & Product - or - LibreOffice from Collabora. Interested to watch Igor Zaika's talk on the Microsoft Office cross-platform architecture which seems to make a lot more sense these days. Mail chew; misc. calls, reviewed code tried to get to some hacking, more mail; sync. call with Philippe; built ESC agenda (rather late), ESC call. Really pleased to see CloudOn's Awesome iOS App released incorporating LibreOffice, and a ton of work that has been done by the community, Collabora, Igalia, Synezip and others. Nice to see the Old vs. New screenshots too. Up; call with Tor, quick mail skim. Out to see Auntie Nicky, Joy & family at a nearby farm shop - had a lovely time with them. Home, E-mail, analytics, partner call, more E-mail. Set off to drive for home; worked in the car. Up lateish; walked up into the town, played in the Castle gardens. Home for lunch; bit of work; sprayed the beams in the loft with woodworm killer so Father can insulate his garage. Watched James Herriot movies with the babes. Out into town for a pint & a nice meal with J. lovely to spend some time together. Up early; moved lathe bits around on skate-board; out for a walk along a beautiful river, with several rope swings for babes out over the water. Back for lunch; mail chew. Worked at mail, built a consulting agenda; product team meeting, consulting team meeting; sync. with Markus & lfrb, sync. with Matus, and Nemeth. Lots of good work going on. Up earlyish; off to St Andrews, Starbeck for a fine service. Back for a large roast lunch, out swimming at Sandra's & moved a rather heavy lathe bed with Father; drilled some holes in a bee-hive for weighing it. Home for tea, put babes to bed. Out in the morning to collect some bee-keeping equipment with Father for Christmas presents; back for lunch. Out for a walk nearby, climbed out onto some trees that had washed down the river and grounded with the babes. Watched an old film about Scott of the Antarctic in the evening. Up late; mail chew; worked on a proposal; then on a report. Encouraged to see the XFastSerializer work Matus did on master taking XLSX export time ~30% faster, nice - should make it quicker to run the profiling tests too. Mail chew; call with Michal, then Tim; lunch. Poked at some code too briefly; back to SOW drafting. Intensive E-mail chew; built ESC stats & agenda; lunch. Partner call, sync. with Kendy. Out into Soham for a parents' evening with the family. Up early; partner call, mail chew - thrashed through the backlog of tasks, chat with Tor, contract review; mail. Out to help with Cub Scouts in the evening; Miriam is one, somewhat surreal inactivity & computer discussion - meeting the formal parent/child ratios I suppose. Slept; somewhere here missed most of a day and several team meetings; chewed through E-mail and a big back-log of off-line work. Partner call on the way home; finally back to put lovely daughers to bed. J. running a PCC training session; call with parents & David; sleep. Breakfast, listened to a great sermon on Haggai; Arthur kindly picked me up; visited his family & home, and out for a fine improvisational pasta lunch with Gabriella. On to a Dinosaur park & wax-work museum, then off to the falls together; a lovely day out. Flight to Sao Paolo diverted due to lack of fuel to stay in a holding pattern; thankfully re-fuelled and managed to make my onward flight (also rather delayed). Up earlyish; the older I get, the worse I handle jet-lag, even an ~insignificant 4hrs & having slept on the plane: hmm. Breakfast, mail chew. Out for a quick coach tour of the Itaipu Dam - a really incredible feat of construction. Its hard to get a feel for a ~200m tall Dam until you see it. Amazing that the concrete was mixed with flake ice not water; an extraordinary piece of engineering. Back to the Hotel, out for another pleasant meat experience. Mail chew, call with Markus; poked at VCL timers / idle handlers. Early to rise; quick call, mail, breakfast; continued on slideware - really thrilled to use droidAtScreen to demo the LibreOffice on Android viewer. Quick lunch, caught up with mail, customer call, poked Neil & Daniel, continued catching up with the mail & interaction backlog. Conference ended - overall an extremely friendly & positive experience, in a lovely location - most impressed by my first trip to Brazil; cudos to the organizers; and really great to spend some time with Eliane & Olivier on their home turf. Out for dinner & drinks in the evening; finally managed to internalize the canonical Brazilian rendition of LibreOffice: Lee-Br-Off-See. To the venue, crazy handing out of collateral, various talks with people; Advisory Board call, LibreOffice anniversary Cake cutting and eating (by massed hordes). It is extraordinary, and encouraging to see how many young ladies are at the conference, and (hopefully) getting engaged with Free Software: never seen so many at other conferences. As an unfortunate down-side: was amused to fobb off an un-solicited offer of marriage from a 15yr old: hmm. Chewed some mail, bus back in the evening; worked on slides until late, for talk tomorrow. Up early; mail chew, interesting breakfast with the Krita guy. Freshened up, met up with Eliane & Olivier, coach to the dam; got the booth setup; partner call. Lunch with Olivier; booth duty. Enjoyed the opening talks; back to the booth to re-charge. Out in the evening for dinner, kindly driven by Artur. Chewed some mail, great things going on while I'm asleep: seemingly I should sleep / wander off more often. Hacked a little on my backlog of things that need work. Flight to FOZ, Brazil appears to be a lovely place; hacked on the flight, taxi to the hotel, hacked in the hotel at length - fun. Mail chew too; call with partner . Poked at tiled rendering foo until late; sleep. Mail chew; call with Kendy, Laszlo, Tor; mail. Lunch with J. team call; more mail chewage, sync. with Matus & Andras. Hurried packing and dropped by J. for some train/plane/etc. to Brazil / LatinoWare. Arrived rather early at LHR; had an interesting chat to a young movie maker off to Jordan; enjoyed rather a good sleep on a lengthy TAM flight to San Paolo. Off to NCC, extremely tired; Tony spoke. Back for a roast lunch; applied slugging, put up some lights & a clock in H's room, fixed M's cupboard. Dinner, showed Babes some Ball Brothers, put babes to bed. Sermon; sleep early. Lie-in, large breakfast: porridge & boiled egg; off to Brandon for a wander through the forest, and play in the playground. Home for a fine pizza lunch. Dropped E. off at a sleep-over. Plugged away at E-mail, and worked late on a profiling problem. Mail; admin, booked hack-fest flights for Toulouse and Munich. Dead pleased with CloudOn's Teaser Video of their LibreOffice based product for iOS - coming exciting. Plugged at mail, partner call, more mail. Lunch, mgmt team call, wrote a LXF column on open source civility. ESC call, merged some patches & back-ported some others. Up early, sleeping poorly; read mail, caught up with J. read profiles & build a report. Shuffled the sales pipeline, there's always room for another entry if you need something awesome doing on LibreOffice. Partner / project call. Dinner with the babes, up late shuffling E-mail - no sight of any code, sadly; sales work variously. Somehow really encouraged to see the prototype LibreOffice 4.4 feature page a month before feature freeze. Worked dead late. Mail chew, wrote status report, out to buy a replacement MCB; admin; built ESC stats. Which gives some timings for rendering a dozen tiles of pieces of your document at different sizes. This of course exercises the headless backend, which has quite some scope for performance work. At least it's rather easy to use cachegrind to profile the run-time there, and you find some interesting things. Lunch, replaced the MCB - even got back on-line afterwards; always encouraging. Broken, feverish sleep; up; feverish E-mail activity. Sync. with Kendy, team meeting, skipped lunch, chat with Kohei, another team meeting. Friendly chat, partner call, dinner, worked late. NCC, ran the older kids bible-study; re-capped John 1:1-18 and had fun; home for a big lunch. Played Othello with the babes, started to feel somewhat unwell, bed - v. groggy. Worked on a proposal, slugged at home for much of the day. Managed to blow most of the sockets in the kitchen - MCB seems to be broken; or was it plugging in my laptop PSU ? hmm. Mail chew, read commits on master (always encoruaging), misc. E-mail. Into Cambridge, another box arrived, got the cluster setup to a degree, made a mess of the server room with non-rack-mount hardware, got several windows' installed & an openSUSE 13.2 (accidentally). Encouraging catch-up with Matus; home early, put babes to bed, call in the evening with Thorsten. Chewed mail slowly. Looked for a replacement battery for this iBUYPOWER CZ-28, thank God for dmidecode - Chassis is really a MicroStar Int'l MS-176K, leading to BTY-M6D; turns out it's easier to un-plug the battery and read the serial number from it though. Churned through mail & project updates. Lunch. Catch-up with Philippe, ESC call, partner call. Arun around for bible study. Mail chew, call with Laszlo, train into Cambridge, got started on some hardware setup in the office; installing Windows is always a depressingly poor experience. TDF board call. Always deeply encouraged by the compound failure of Windows - installed the latest video drivers, and an un-bootable, hard-locked system; nice. Waited late into the night in the office, home by train. Worked even later on tiled rendering performance / tests; amazingly it seems we're rendering invisible progress bars on document load, and rulers that don't show up in tiles and; bed.